Technological development for the valorisation of the Peruvian biodiversity and Productization of its gastronomy. Drivers: health, gastronomic value and convenience. With limited global impact but internationally recognised development. High quality produce which needs new valorisation markets. Integral innovation agent for the agrifood industry. One of the most important markets at global level. Access to other markets (Central and Northern Europe). Contact with millions of residents and tourists. Obtaining product innovation guidelines in line with the UK-Europe consumption trends. Healthy food, functional food, new formats … Drivers: health and convenience. Technology centers network. Partnership agreements with top-rated technology centers. 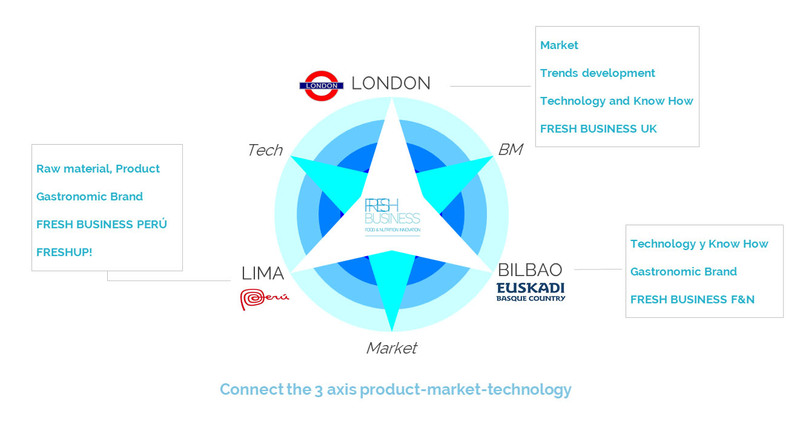 Development of business models and marketing strategies that allow the introduction of Peruvian products into UK-Europe. World leader agro producer for a variety of products. Drivers: gastronomy and health. Need and opportunity to valorize natural products. A leading global gastronomy brand. Technology plans and tech-led innovation projects. Support from the technology centers network linked to Fresh Business. Incubation and acceleration of food startups.